Whole Person Recovery is an approach that recognizes that Recovery is about Restoring and Rebuilding. It is assumed that a person may have “structural damage” physically, emotionally, socially, etc. and will go through various stages of change on their way to wholeness. According to Al J. Mooney, MD, of Willingway Hospital, there are three phases which he also refers to as ‘zones’ and describes in detail in his book, The Recovery Book, 2nd Edition. There are many Pathways to Recovery! Since 2000, there has been a growing focus on the array of services and community systems that provide essential Recovery Support Services (RSS) to help people through the long process of returning to health. This page will introduce you to major concepts within Recovery Support, including Recovery Oriented Systems of Care/ ROSC. For two decades I have been privileged to serve on state, national and international initiatives to strengthen and enhance Recovery Support in dozens of nations. NET Institute has developed training to formalize the role of “Peers”, people with lived experience of personal recovery from addiction and/or mental illness, who provide a valuable array of Recovery Support Services in many settings. RSS are NOT the same as treatment and only recently have they been recognized as a critical part of the continuum of addiction care. Many of these support services began long before the modern era because hundreds of thousands of people have had NO access to clinical treatment or professional addiction services. recovery sponsors and mentors, recovery community networks like AA, NA, etc., faith-based recovery services, family services, and programs for prisoners and the homeless have served millions of people worldwide promoting abstinence, social belonging and relationships, practical life skills, personal growth, responsibility and service to others. People can and do recover. Check out our helpful coursework in Recovery Dynamics. Continuing Education credit is included for various courses for Florida Certification Board, Board of Health licensed professionals, and others. NAADAC accepts a total of 30 hours of Online training for their National CPRSS credential. NOTE: Recovery Support Specialist/RSS (Addiction) and Peer Specialists/PS (Mental Health) primarily work helping people in active addiction, mental illness or both who may need treatment, behavioral health services and/or recovery support services such as: connection to community services, recovery housing, food stamps, transportation, medical services, support with legal and criminal justice issues, etc. Recovery Capitol is another helpful concept in Whole Person Recovery. It is defined as: Resources available to the client to support initiating & maintaining Recovery from a life-changing disorder. Imagine trying to get your life together while living under a bridge and spending your days seeking safety, transportation to needed services such as free food, or day labor, plus looking for alcohol or drugs. The ability to make such serious changes is dependent on other non-tangible personal characteristics. Tens of thousands of people never receive clinical treatment for their addiction or substance use disorders. Of the 23+ million people in the U.S. who meet criteria for addiction, approximately 2.3 million people go to treatment. Some go multiple times since they need more time in a structured environment or a different level or type of treatment care. Since the early 2000’s the idea of Extended Recovery Support to meet the overwhelming need of individuals and families has been championed by many people in government, in the clinical addiction field, and in communities of people in personal recovery. Thousands of people in Recovery have mobilized in the past decade through training programs and special certifications for redeployment in their communities to help meet the needs of people impacted by addiction. To meet the growing demand for Peer Specialists across the nation, we have created a full 40 hours of online training. Now, for the first time, you will have access to affordable, practical, self- paced courses covering all of the major content areas you need to prepare for this rewarding new profession. in recovery from any life altering event or disruption, including substance misuse and mental illness. that allow them to provide recovery support in such way that others can benefit from their experiences. employers, health care providers, government entities, and other agencies in the addiction and mental health fields. 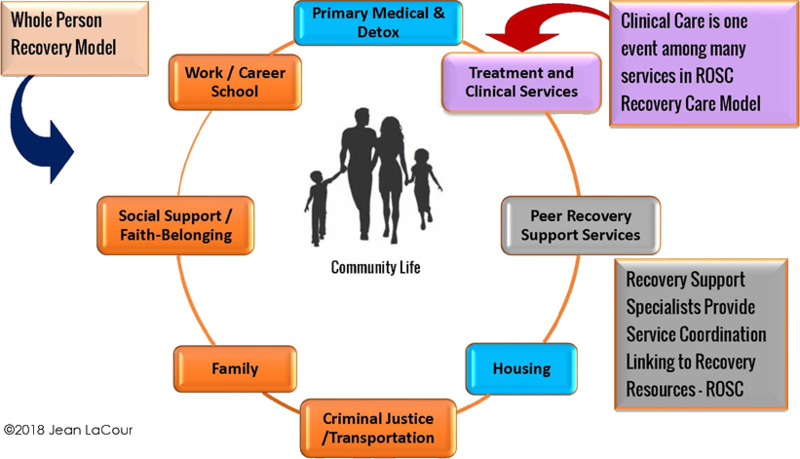 Recovery-Oriented Systems of Care or ROSC is a model and strategy developed in the early 2000’s to address the need of people in various stages of Recovery for Extended Recovery Support in order to rebuild their Recovery Capitol utilizing the support of specialized NON-clinical workers within their own communities. for those with or at risk of alcohol and drug problems. Recovery-Oriented System of Care: "ROSC"